Fire & Safety Industries (FSI) is an Australian owned leading global entity in the fire protection industry. FSI provides its customers with quality products at competitive prices with industry best practice after sales support. With a reliable reputation and a comprehensive level of expertise, it is FSI’s passion and desire to lead the fire & safety industry with innovative system design and longevity. Fire & Safety Industries is strongly focused on internal and external safety procedures and is dedicated to providing our people with the right skills ensuring compliance with all industry codes, Australian Standards and legislation as well as customer safety requirements. Safety is our No.1 Priority and our overriding duty to ensure the health and safety of employees and clients. FSI has a long-standing experience and high level of expertise. FSI has a high level of expertise and a proven history of over 25 years’ experience operating in the domestic and international markets. FSI has formed strategic alliances with specialist manufacturers of fire suppression and detection equipment throughout the world and are able to offer the latest in technically advanced firefighting solutions. Our Management Team have a wealth of knowledge and experience across all areas of fire suppression and detection with many years devoted to the fire industry. FSI offer a complete range of fire detection and suppression products to suit any commercial or industrial application. From smoke detectors and fire indicator panels to foam systems on large scale mining equipment, FSI can offer a solution for your highlighted fire risks. FSI manufactures, installs, and maintains its own state-of-the-art system called the ‘Foam-Guard Fluorine Free Fire Suppression System’. This system can be configured to suit all applications whether in mining, agriculture, forestry, construction, transportation, marine, or manufacturing industries. FSI has a complete range of products for special hazard and fixed service applications. From sensitive data processing facilities and priceless artworks, to oil refineries, explosion prevention and other critical processes, FSI can supply you with a solution for all of your fire suppression & detection needs. Fire is an ever present threat that can result in losses to human lives, capital equipment and production. Adequate fire protection is a critical and serious necessity and should form part of any company’s risk management plan. FSI provides a range of fire protection products to further minimalise the devastating effects of fire. FSI’s Foam-Guard pre-engineered, fluorine free foam (F3) fire suppression system received formal approval and Activfire listing in May 2017 with full compliance to AS5062-2016. AS5062-2016 covers the system fire-fighting capabilities and complete testing of system components including vibration, corrosion and quality. Following FSI Safety Management Plan, we provide quality service technicians holding the necessary qualifications to cover the full scope of works including installations, preventive and corrective maintenance, statutory inspections and testing. An Enclosure Integrity Test is a mandatory commissioning and maintenance function for any gaseous extinguishing system that complies with ISO 14520, NFPA 2001, EN 15004 & AS ISO 14520. Fire hydrants require periodic inspection and occasional maintenance in accordance with AS1851-2012. This ensures they will work in an emergency situation allowing the fire brigade or rescue appliances to connect their hoses in the vicinity of the fire to access water easily and efficiently fight a fire. To ensure the fire suppression system operates as designed and when required, routine maintenance and inspections are critical. FSI Planning personnel typically work with end user planning personnel to ensure correct asset details, service plans and schedules are agreed with all parts and labour available. Our technicians utilise IPad technology for completing reports, OHSE requirements and other technical requirements. 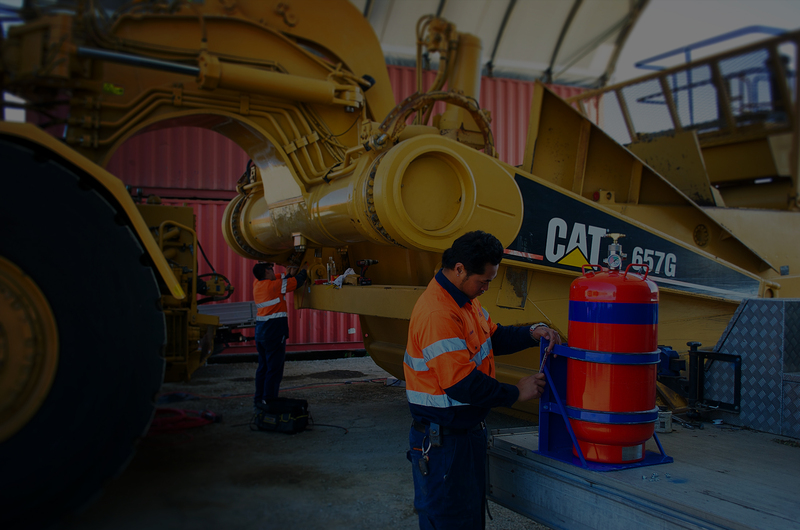 FSI experienced technical staff can conduct site & system audits including Mobile Suppression Systems, Detection and Alarms, Gaseous Systems, Fire Extinguishers, Hydrant Pumps and Circuits, Emergency Lighting and other related areas as required all to the applicable Australian Standards and site specific requirements. Fire and Safety Industries holds a collection of resources with a focus on safety, prevention, fire management and fire-related subjects plus a wide range of other materials. FSI offers a educational resource to extend customers knowledge on fire prevention and safety issues. The FSI team can be reached Monday to Friday between 8am and 5pm. To enquire about how Fire & Safety Industries can assist your business, please email us using the form. To enquire about how Fire & Safety Industries can assist with your fire protection requirements, please contact us using the form and one of our friendly representatives will respond to you shortly.